The spoon carving knife I forged this summer at summer camp has finally been heat treated and tempered. With a propane blowtorch I got it up to cherry red for a few minutes then plunged it into vegetable oil. While it didn’t temporarily catch fire, it did harden the blade. Then I treated it at 400 deg in the oven for an hour. I’m hoping for a hardness of 54-60. Other knives can’t scratch it now, and it was a bear to sharpen, so I know it is harder, but not how much. 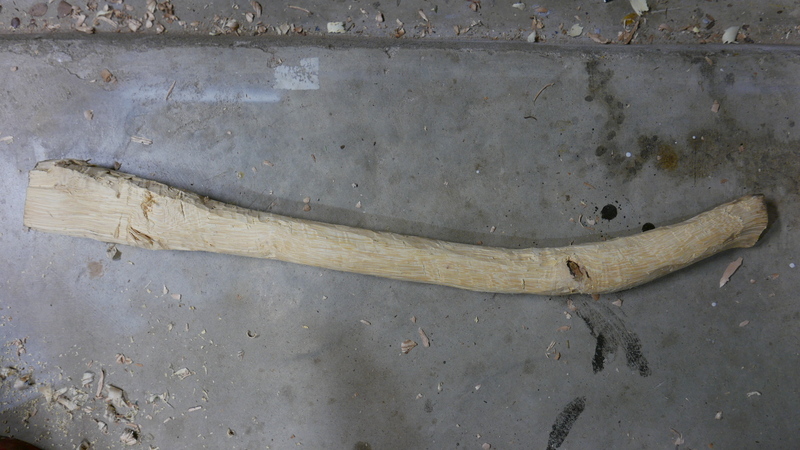 Next I’ll sand the handle to 200 grit and coat with oil, although I do kind of like the roughness for handling it. 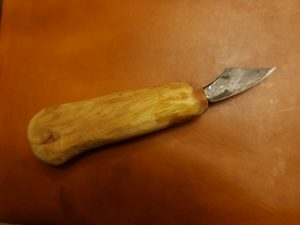 Spoon Carving Knife with handle of Juniper. Posted in news and tagged carving knife, forged, spoon knife by admin with comments disabled. After a few months of on and off excavation, the pad has been poured. 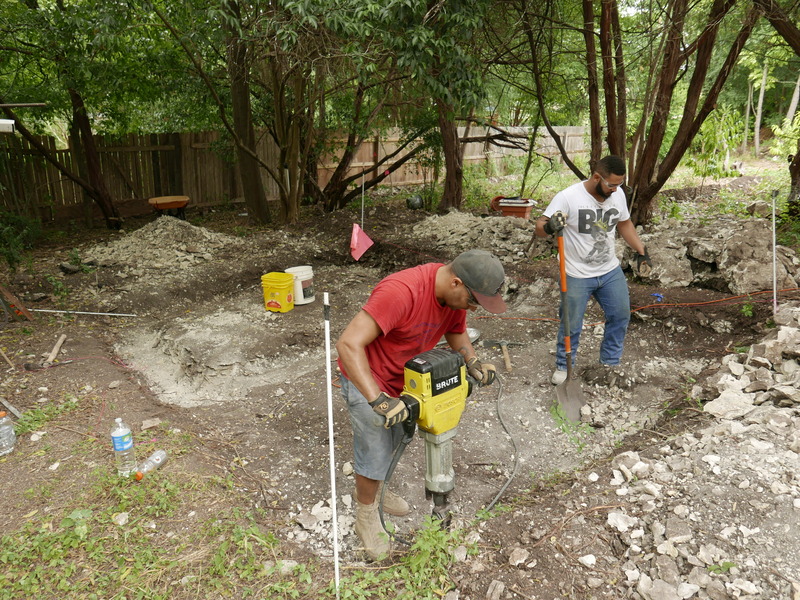 The excavation in the limestone was around $1800, the form $200, the concrete $1700, and the pumping $500. Not cheap, but I wanted a strong foundation. Ground is sloped at about 16%. Having to excavate a step foundation for a monolithic slab. Hopefully soon we’ll build the form. Deep end is 2′ shallow is 6″ Area is 210 sq ft.
Posted in news and tagged foundation, sloped by admin with comments disabled. For some odd reason, I’m a little obsessed with scarf joints. Dunno why. I notice them when I travel and see old structures. I took photos of them at Czocha castle. Anyway, I’ve had it on my bucket list to make some and it has taken up way too much brain time. So I made one to get it out of my system. It started out cutting down a hackberry tree in the back yard. 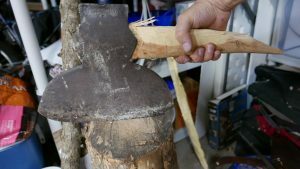 Lopping off a straight limb and then hatcheting it to reasonable square. From there, I used my japanese plane to make it square and flat. Once I have useable dimensional stock, I then made a template of the joint and drew it on the side of the stock to guide the saw cuts. I may have made the points a bit too sharp as it was a pain to get a chisel in there, so next time, a much lower angle of attack. If this scarf joint was used for some serious load bearing application, I’d have used a 1:8 ratio of thickness of beam:length of scarf. Since this was a demo I just did 1:2. The complete keyed scarf joint. 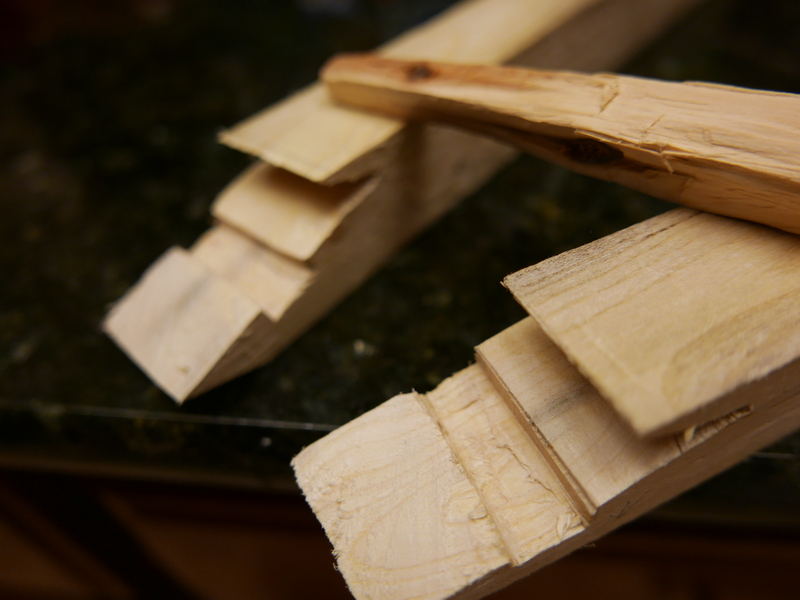 The peg would normally be sawn off flush, but I leave it proud since it is a demo joint. The two halves of the scarf, with a cedar peg. I’d made a 1×1 before from hackberry but it was not good wood nor green. Used these plus the carpenters square and plane to make the stock dimensional. 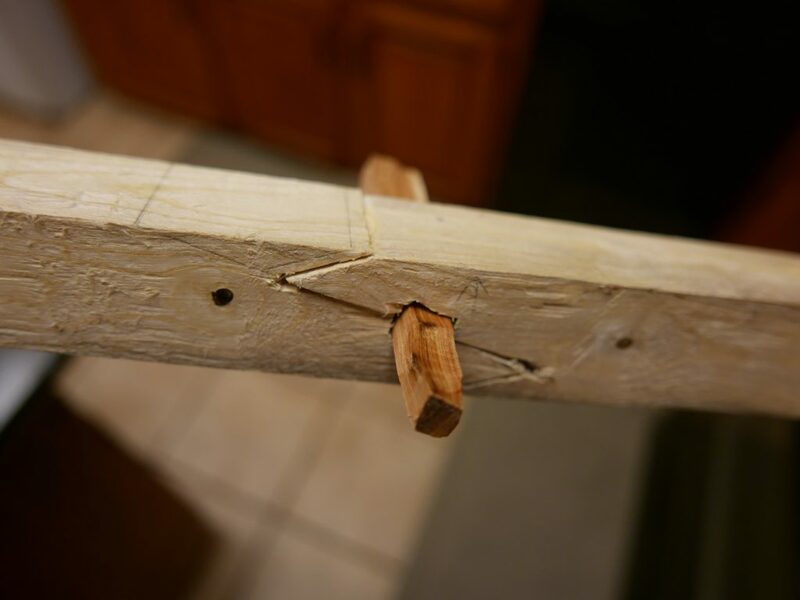 Posted in news and tagged keyed scarf joint, scarf joint by admin with comments disabled. 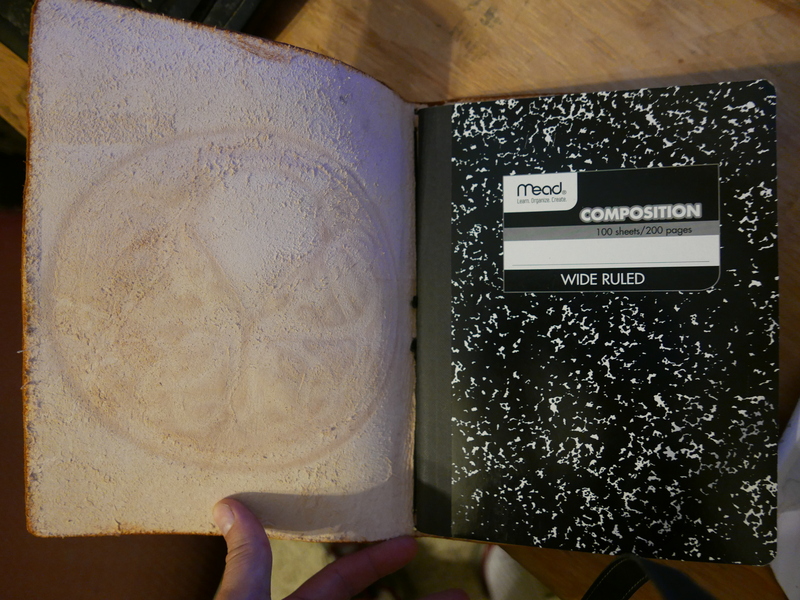 Once the leather was cut, I had to square up the rough cut. Then the design went on pretty fast. After that, the cutting and tooling was long and methodical. 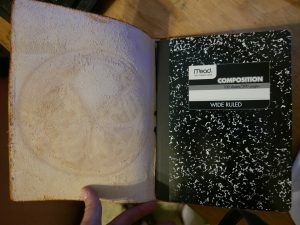 Posted in news and tagged leather notebook by admin with comments disabled. The drain is done! Hallelujah. Total cost DIY plus some labor of about $1800. 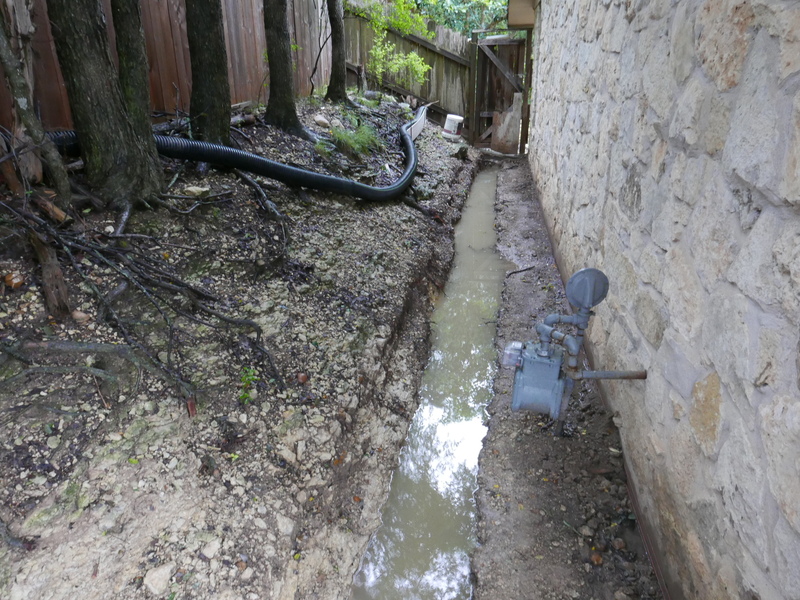 Had to rent a jackhammer to deepen the drain and the water pipe channel in the back yard by 4-6″. Once the ditch was dug, we ran a garden hose to it and filled it with water to check the level, making sure it drained. Once confirmed, we lined it with landscape cloth, put in the plastic french drain pipe withe perforations, then the gravel, then a layer of landscape cloth over it. Then 3″ of gravel again and the paving stones over it. This all leaves the 8″ before you reach floor level in the house. 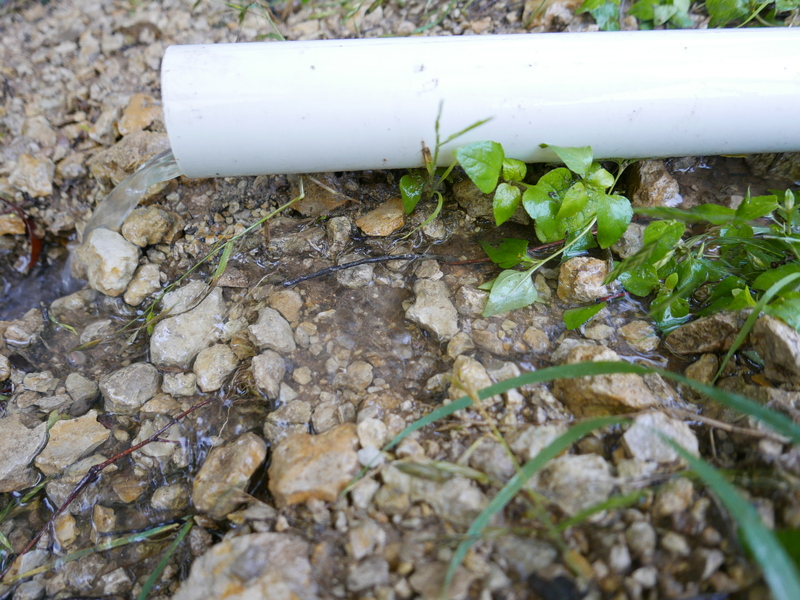 Connecting drain to water runoff pipe. The drain collects it, the runoff pipe takes it away from house. The pipe isn’t connected yet in the photo. Under best practices I would have used a white perforated pipe for the French drain pipe, to make it easier to clean-out in 10-20 years. But the previous contractor already had the corrugated black one, so it was reused. 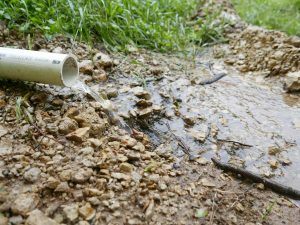 Plus, the ideal gravel is supposed to be 3/4″ diameter, and I had 2-3″ gravel which could be used for a French drain without the pipe itself. So basically I have two drains in play. 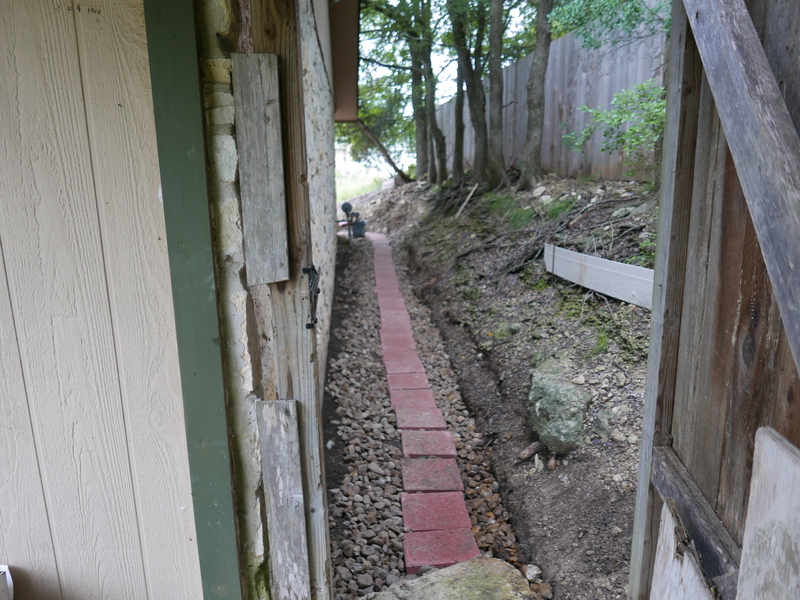 French Drain done! With paving stones in middle so wheelbarrows can navigate atop it. The paving stones we laid on top were about $1.50/sq ft which is more than I pay for tile, but the wife had a good point, we needed to roll wheelbarrows along it. The 2-3″ gravel is an ankle twister to walk over, a wheelbarrow is worse. The connection from a 4″ French drain pipe to a 2″ PVC pipe was done using a drain grate box of 4″ to 4″ then a 4×3″ adapter and a 3×2″ adapter as you see in the picture. I leveled out the runoff line to drain the French drain, and realized that once I put in the PVC pipe, if I fill in the ditch with 2″ gravel, I can drain the yard there as well. The space between the outside of the pipe and the ditch is the annulus and so I call it the annulus drain. So the pipe takes water away from the side of the house, and the annulus gravel drain takes it from the low part of the yard. 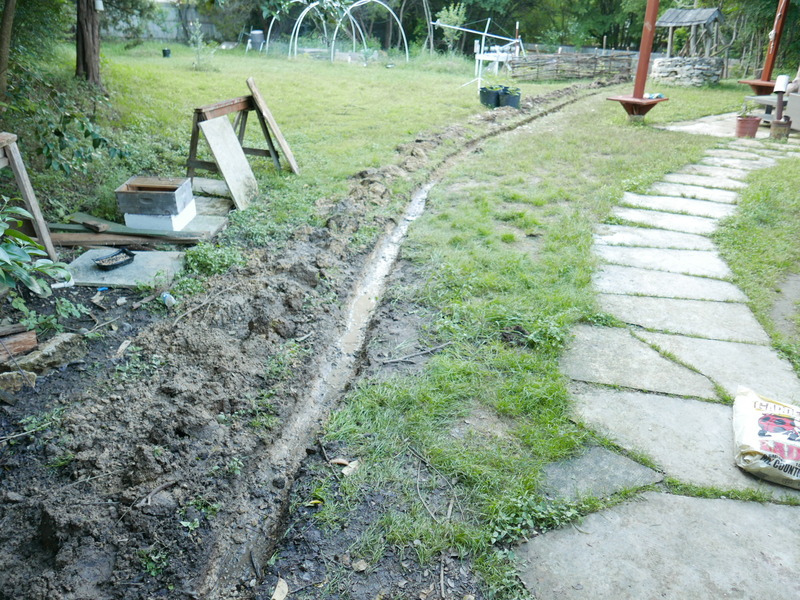 Runoff line in place with gravel by it to make a annulus drain as a bonus. Where the large standing paving stone slabs are is where we get standing water after a rain. 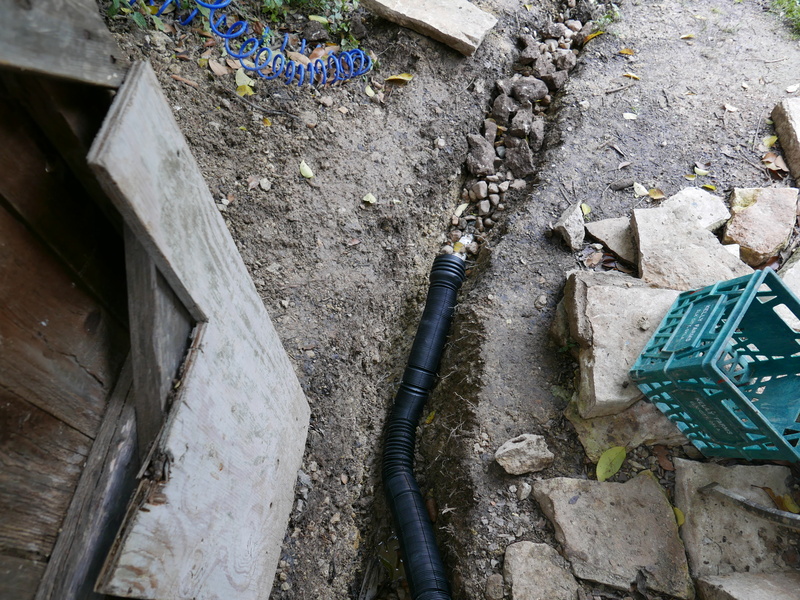 The French drain in action. There is no sign of water at the side of the house. On the right you see the swale that captures water for the orchard. It is about 20′ long. While the primary drain water is obvious, notice the water on the ground the pipe midway, That is draining from the annulus drain! It works! 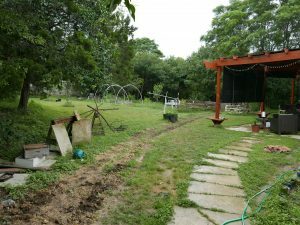 Update June 3, 2016 – hit with 3″ rain in 2 hours. 2″ diverter pipe at 1/2 capacity and working like a champ. 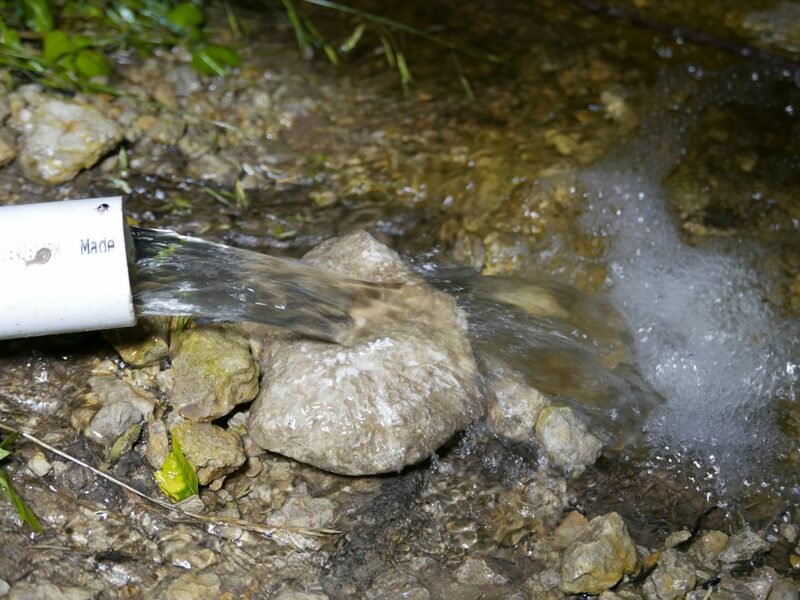 3″ of rain in 2 hours, The 2″ pipe was running half capacity. Posted in news and tagged DIY, French Drain by admin with no comments yet. 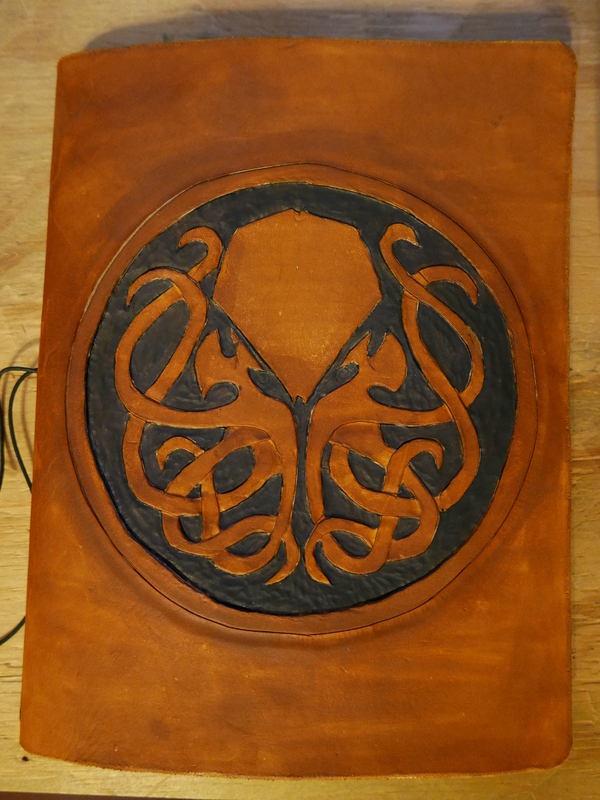 May 2nd Leather Notebook Cover of Czocha is done. Had a good week of finishing projects. 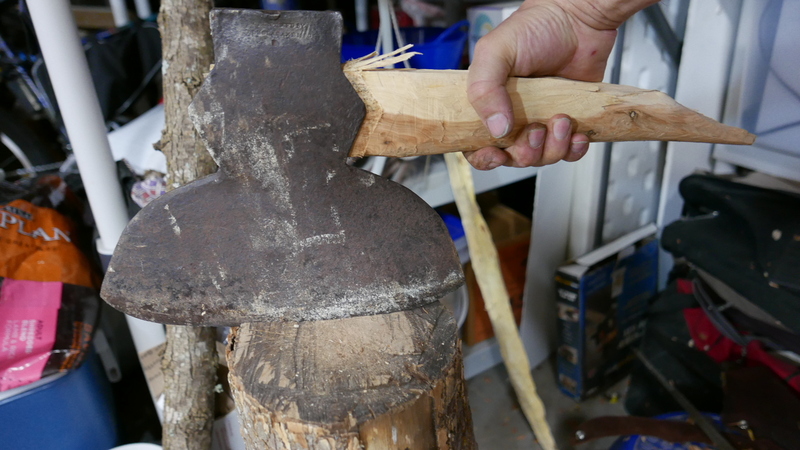 Finally got the axe hafted with the Douglas axehead. Wickedly heavy brute of 9# and sharp as sin. Also finished the first notebook cover. 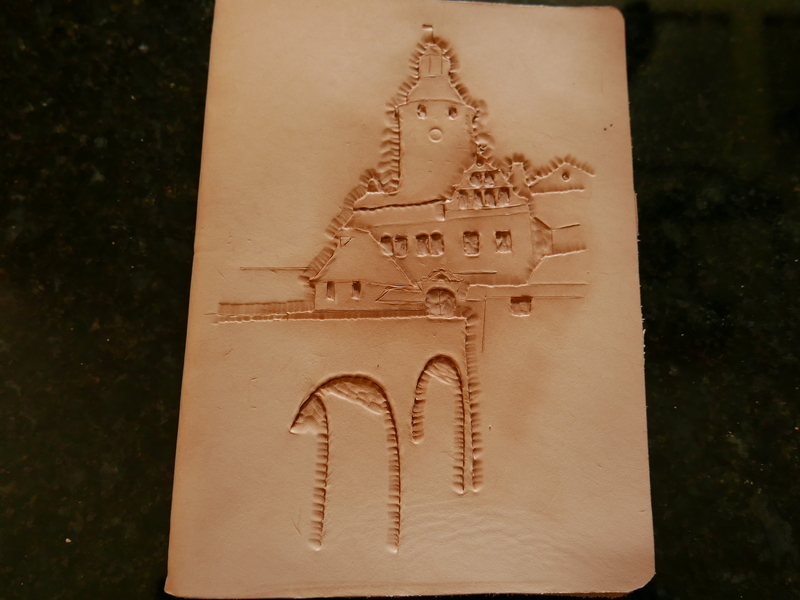 Using 2-3mm veg tanned leather, a hilighter stain, and some tooling. I got damn lucky that someone did most of my design for me at http://www.123rf.com/photo_13186022_old-castle-czocha-in-poland-on-sketch.html which is Czocha from College of Wizardry 4. 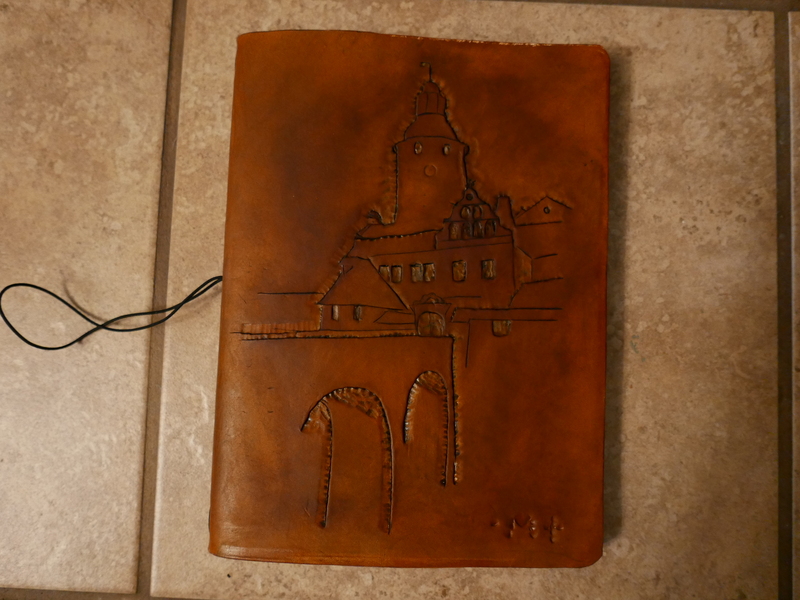 I took the vectorized outline and then wetted the leather, let it dry 10 minutes then taped the printout over the leather and used a stylus to push lines into the leather. Then an x-acto knife and swivel knife to make the cuts. After which I used highlight stain to stain the cut lines, then saddle tan dye to darken it up. Designed for a 8.5″x11″ Mead notebook. The main drain is dug, but not quite deep enough. Needs another few inches which requires lots of banging with a rockbar. 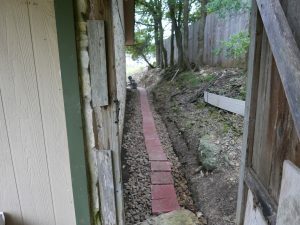 Discharge trench, putting in a 2″ or 3″ pipe connected under the fence door. Discharge thru the front would require cutting a trench thru the driveway cement, backyard is easier and I can build a swale to catch the water. Posted in news and tagged French Drain, swale by admin with comments disabled. I’ve got a 1890’s Douglas Axehead model ‘Pittsburgh” for hewing. 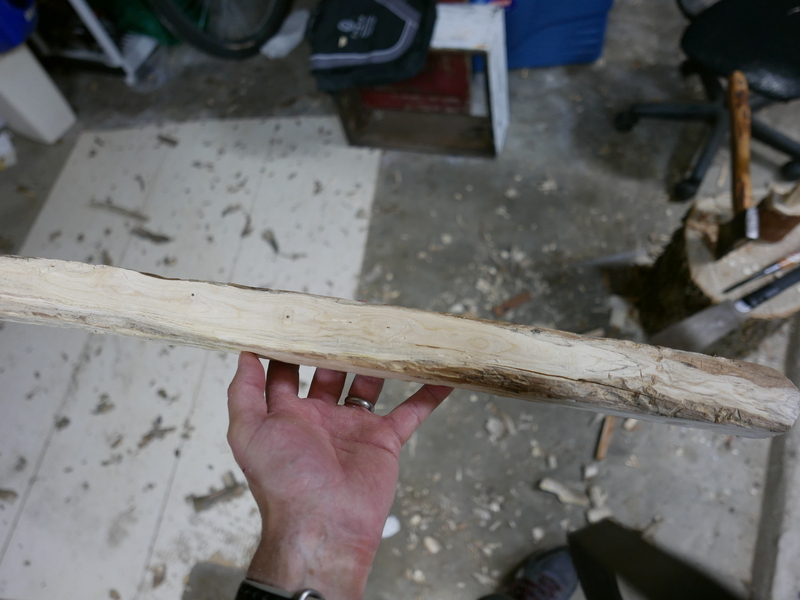 One side is beveled and it is a little offset for hewing timber into lumber. I hafted it with mountain cedar (juniper actually) and after an hour of use the beefy handle broke much to my surprise. It was a *very* beefy handle overly thick and still it broke. That tells me juniper is quite brittle and can’t use it for handles for striking tools. I still have one on my spoon hatchet but it has broken once, an I merely reused the handle because it was too long anyway. I’m using oak this time, it worked for my mallet, which also had a broken juniper handle. The handle is naturally curved oak wood from the tree that fell in my front lawn. I’ve gotten it shaped to roughly what I want, I’m going to leave it to dry for another 2 weeks then work it down to the final shape. I really want to avoid any shrinkage after fitting. On length, it is for hewing not felling. So shorter than a felling axe, and research says about 28-30″. After all, this axe is just going up and down to chop off wood lumps between the jogs. Finished the hafting. 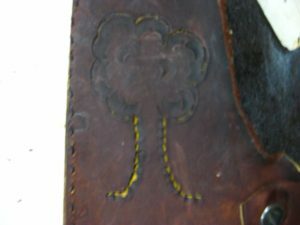 Leather cover from scrap leather and some tooling tools. 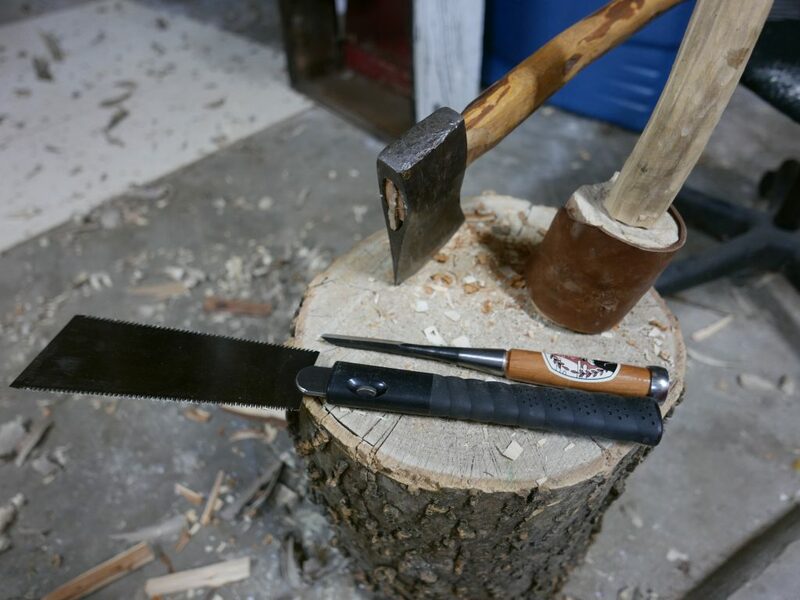 Douglas Pittsburg 9# axehead on a 29″ handle. 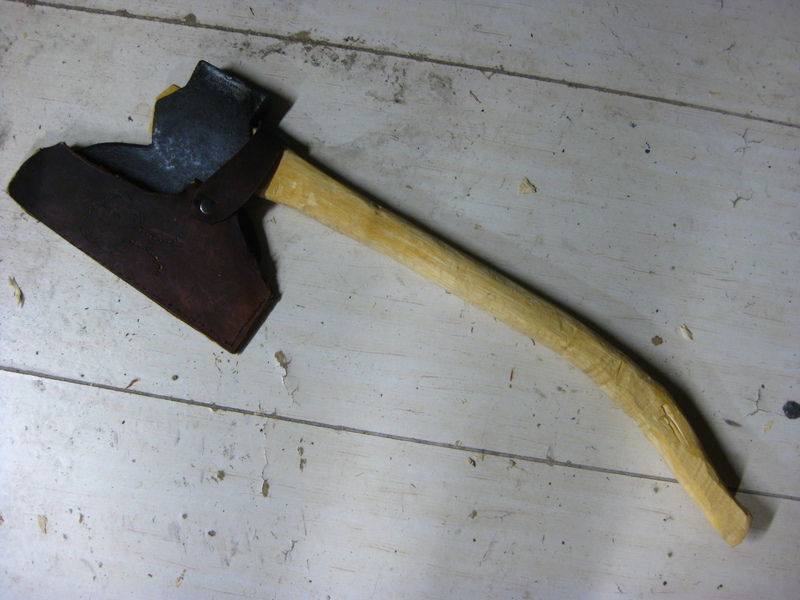 32″ from bottom of handle to toe of axehead. Scrap leather cover with a nice little tree. Forgot to update, built this 6 months ago. 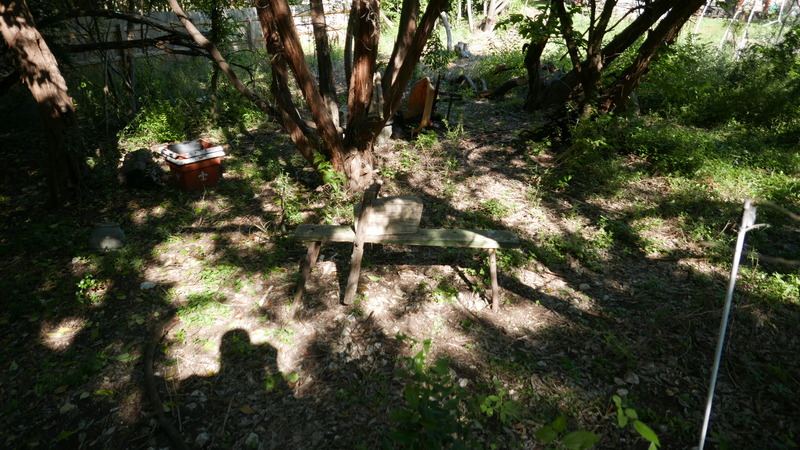 the clamp lumber was a split hackberry that later cracked, have to redo. Lessons learned: make sure the front legs of the horse are far forward not to touch the lower foot clamp when fully extended.